Peace and quiet AND a nice glass of locally produced wine - it doesn't get any better than this! We planted our two acre vineyard in 1999 with the help of friends and neighbors. 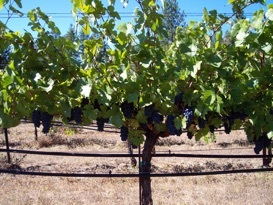 The vineyard is mostly Pinot Noir and Chardonnay grapes, along with small plantings of Syrah, Merlot, Cabernet Sauvignon, Pinot Gris and Viognier. 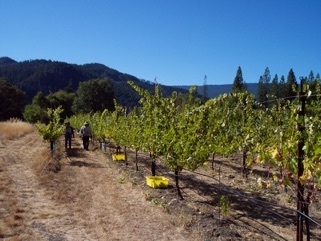 We recently planted about 100 Tempranillo plants as well. 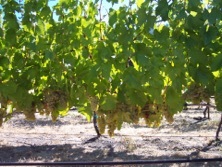 We manage our vineyard primarily by hand without using herbicides or pesticides and we only use natural fertilizers. Warm summer days and cool summer nights help to improve the color, acids and flavors of the grapes from which we make wine that we believe reflect our values of treading lightly on the land. Harvesting usually occurs from mid-September to mid-October. Our wines are made in the Burgundian tradition. We will not be producing a 2015 vintage. The forest fires here during August produced too much smoke which damaged the fruit, so we’ve decided not to harvest. We are currently selling our 2013 vintages. 2013 was an excellent year and our Pinot Noir, Chardonnay and our Trinity Noir,which is a red blend, are available in restaurants and stores in Trinity, Shasta and Humboldt Counties, as well as here at the winery. Our 2014 wines are aging well in barrels. Contact us for a private wine tasting and tour.